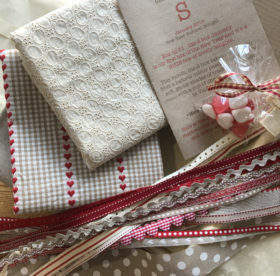 Here at the-stitchery, we love collating inspirational selections of haberdashery and fabric which we hope you will LOVE ! We adore the natural linen woven heart ribbon in two colour options – it’s ‘practically perfect in every way’ ! We love fabric (of course we do!) and this month you will get a generous 50cms of each of the three fabrics included. WOW! We can hardly fit them in the box!! Why not treat yourself or a friend to a subscription? go to this page for subscription options and savings. 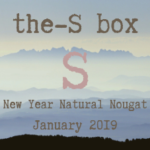 We’re already putting together the-S Box February 2019 – why not pre-order online and guarantee your box? 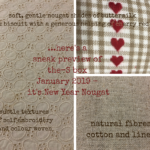 January Contents includes three fabrics; a medium-weight Linen & Cotton Union, a natural self embroidered Cotton Lawn and a Cotton colour-woven check with hearts. THE SMALL PRINT: Small parts included THIS IS NOT A TOY, not suitable for use by children without adult supervision. the-S box should arrive intact and undamaged. We pride ourselves on the quality of our individually cut and selected products. Please don’t hesitate to contact us if you are unhappy with the quality of the contents of this box and we will resolve the issue. EXCITNG NEWS: If you want to take out a rolling monthly subscription to the-S box without having to commit to a big stash of cash up front, visit uOpen.com and grab a guaranteed the-S box each month for £19.90 including postage.